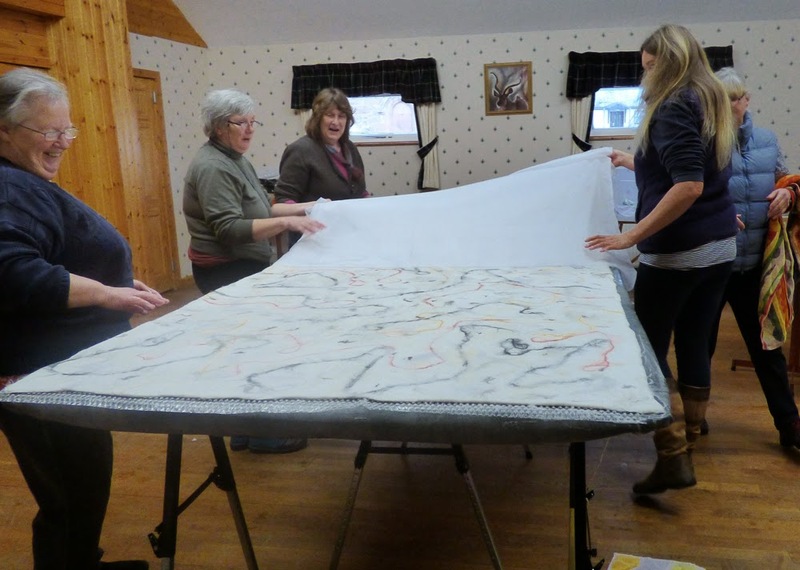 On Wednesday, 14th January 2015 several of the volunteers of Groam House Museum gathered in Fortrose to make a start on a large felt wallhanging inspired by the work of George Bain. Groam House Museum in Rosemarkie houses a magnificent ancient Pictish cross slab, a collection of many smaller sculptured stones and a huge amount of work by George Bain. He was an art teacher in the middle of last century who was inspired by the art of the sculptured stones of the Picts and the magnificent Celtic manuscripts from the same era. He wrote the book - "Celtic Art - The Methods of Construction" and it remains an important book for anyone wanting to understand how Celtic art works. I was first introduced to his book some 25 years ago and was quickly hooked on Celtic design. 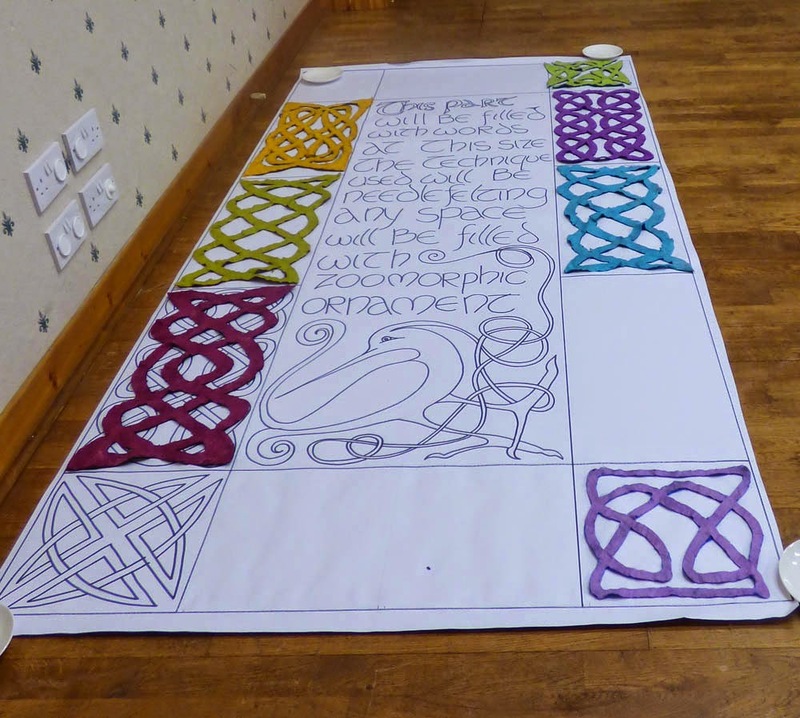 The museum's outreach programme have recently been awarded a major grant by the Heritage Lottery Fund to interpet some of Bain's work and the Pictish stones of the area in the form of 5 large wallhangings and I have been fortunate to be invited to be the textile artist leading the project. 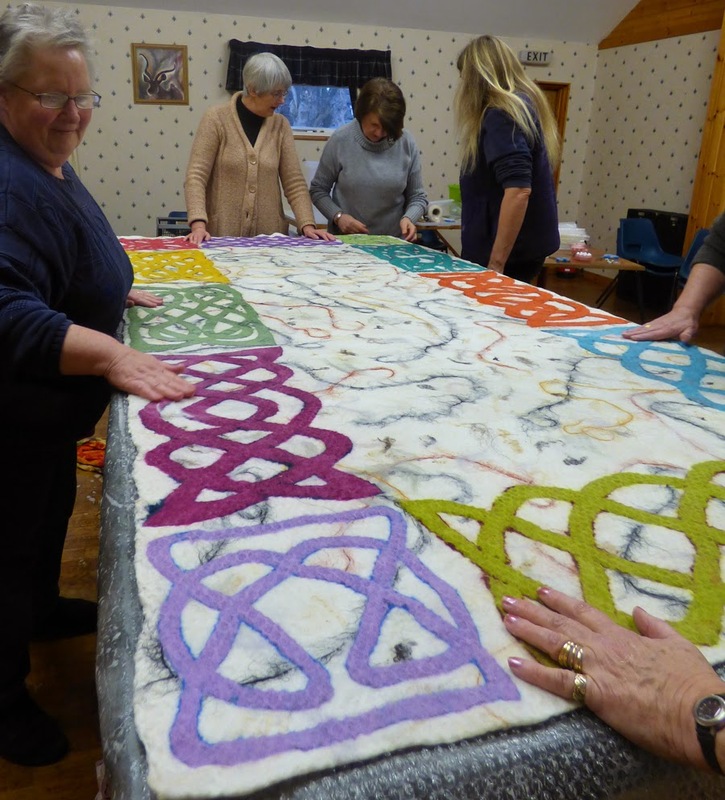 The first wallhanging is being made by the museum volunteers and subsequent panels will be made by other groups on the Black Isle over the coming months. I will be posting a selection of photographs over the coming weeks as the project progresses. These wallhangings should end up at approximately 3 feet wide by 6 feet high - which means they have to start out at 4ft x 8ft. The felt shrinks as the felting progresses. 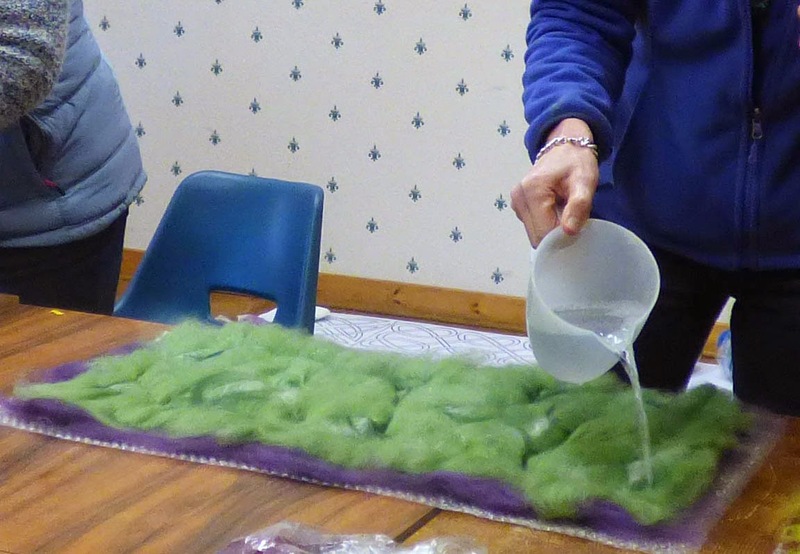 We will be using a combination of different felting techniques to create the designs. The first step was to choose colours for our design. 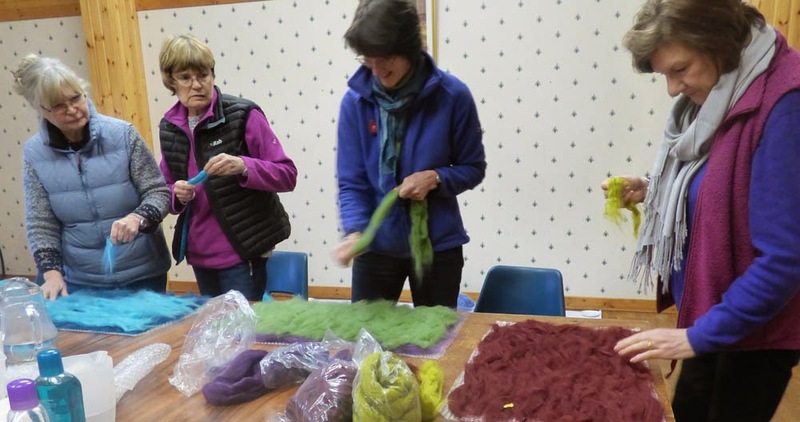 The next step was to lay these coloured merino wool fibres down to make small sheets of half-felt. 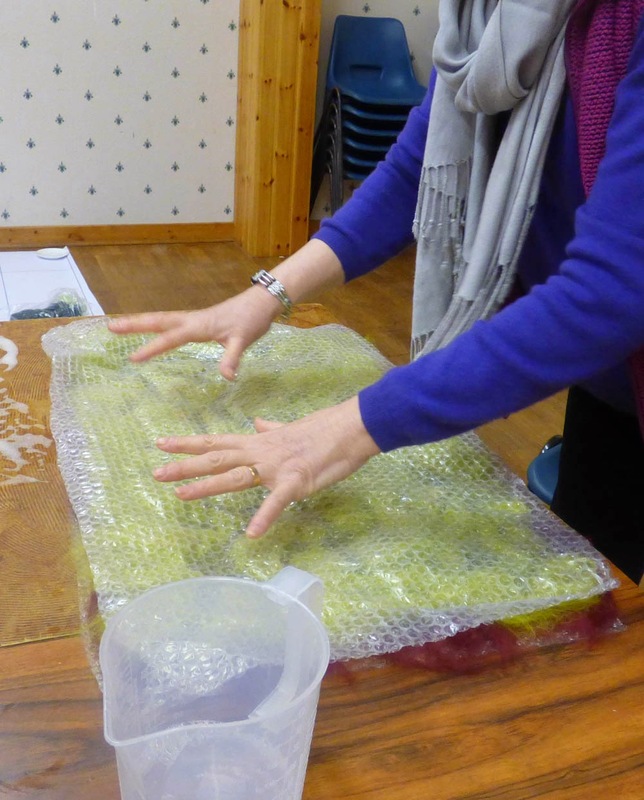 Then, cover with bubblewrap and start rubbing. 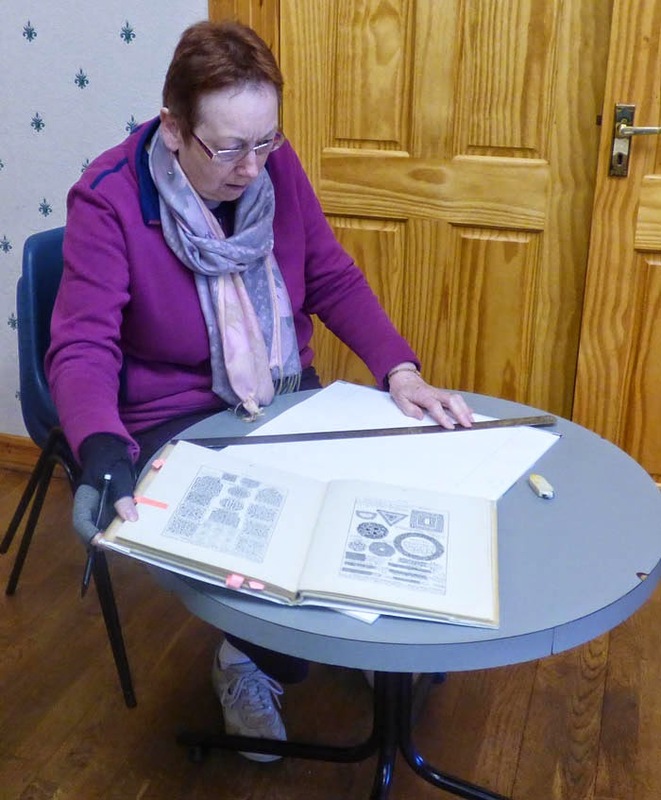 Rita has a wrist problem that meant she was not able to do the felting, so she set to work drawing out some knotwork designs at the required scale. 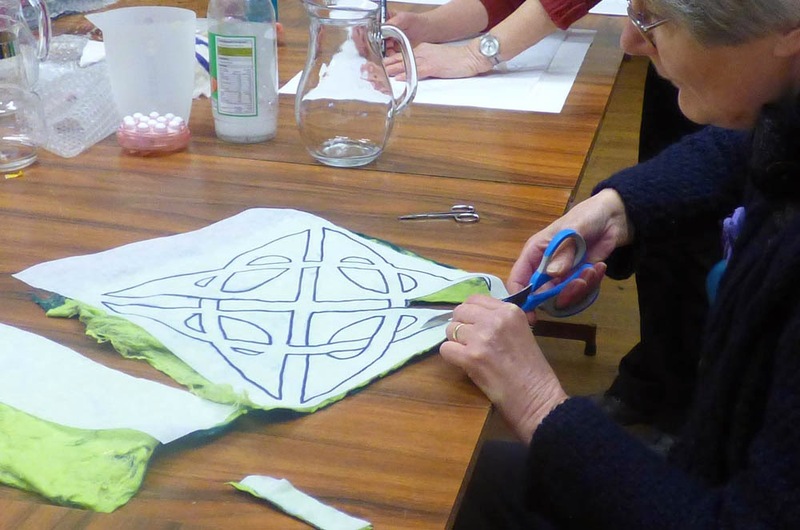 These designs were then traced onto a special paper that could then be laid onto the wet half felt that would allow us to cut out our knotwork panels. a lot of the water ended up on the floor! 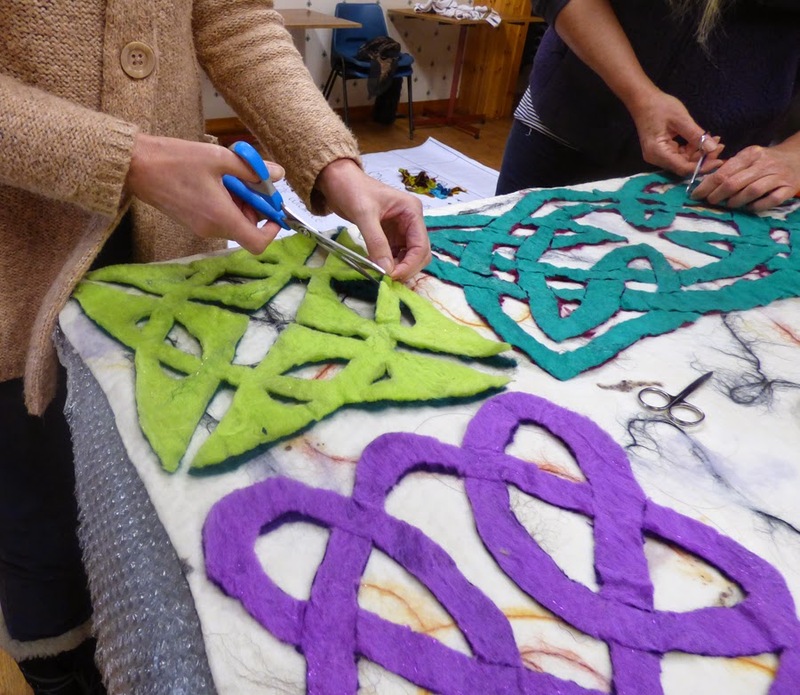 And after several hours of work, we have most of our half-felt knotwork cut-outs ready to use in inlay technique for the next stage. Watch this space............! 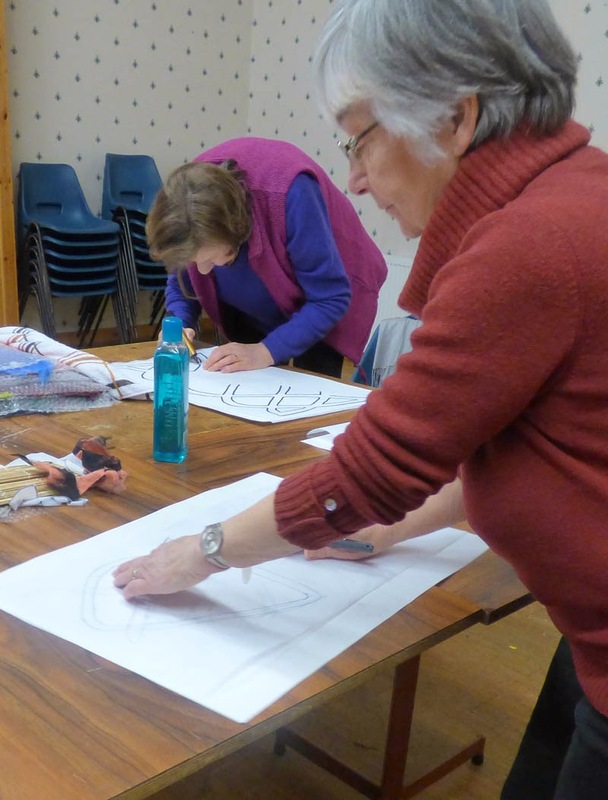 This time we made a start on the big piece of felt that will become the wallhanging. I set up my new felting table which I had made for me by our local joinery firm - Macdonald & Macintyre. It measures 1200 x 2400 mm (8 x 4 ft for those still in imperial measurements!). 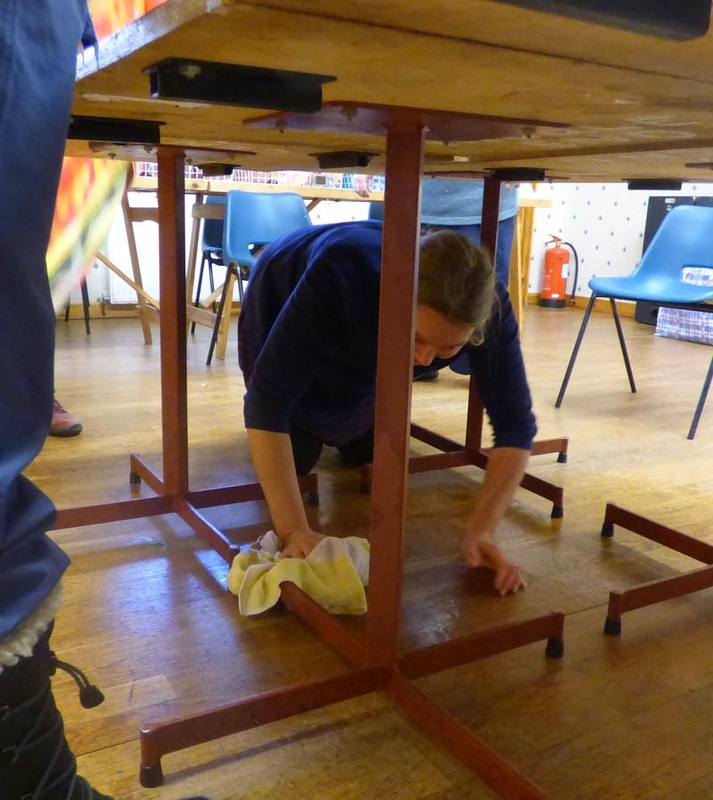 The legs are height adjustable fold-away trestles and the table top is in three sections that slot together and lock in place on top of the trestles. This means the whole thing fits in the back of my car so I can take it to where ever it is needed. I made a cover with leatherette vinyl fabric and a cord round the edge so it can be held tightly around the table top. We set it up with legs at maximum height so that it was comfortable to stand at. 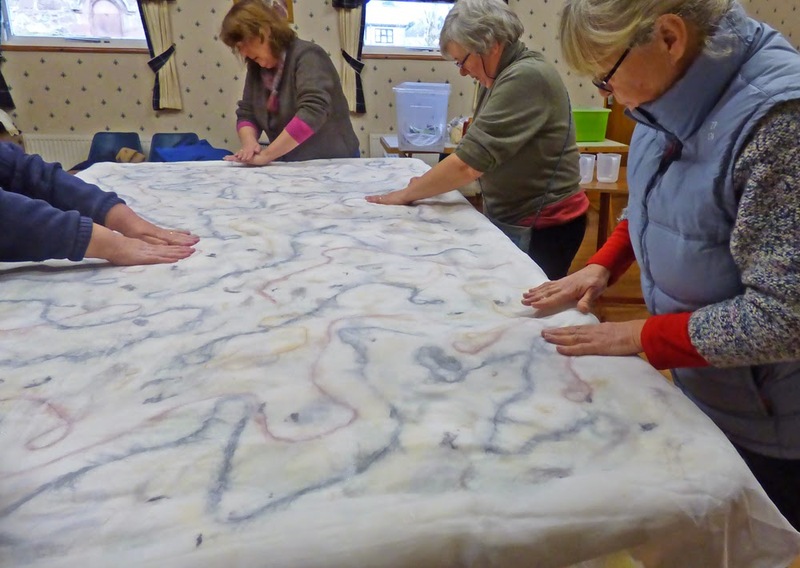 We started off with a layer of ice wool which saved us having to spend time laying down an extra layer of fleece and ensures that there will be no accidental holes in the felt. 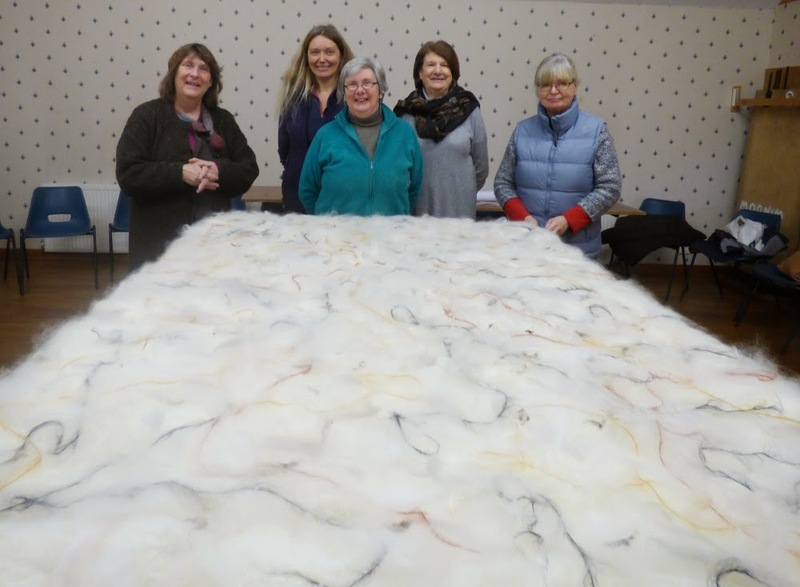 This was covered with two layers of white merino wool fibres - the first layer the fibres ran parallel to the length and the second layer they were in line with the width. Once both layers looked complete we poked and prodded to check for thin patches and holes - all of which got filled up with more wool. The prodding is best done with one's eyes closed - touch is a better sense to use, but tends to get over-ridden by our sight, which can be deceiving. 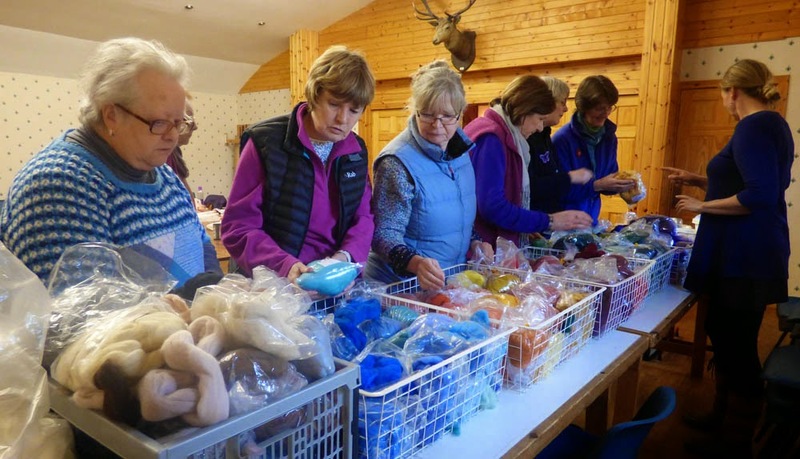 Next we added a lot of "bits and pieces" - little bits of silk fibres, bamboo fibres, coarse wools, mohair yarn and even some bits of highland cow hair. We were aiming at providing a bit of texture and surface interest rather than just having the plain white wool. 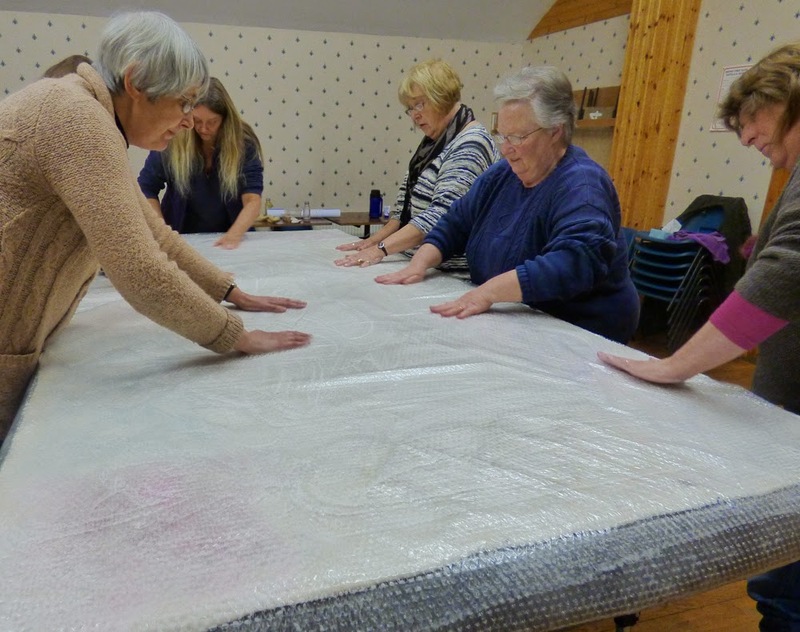 The organza was replaced with a sheet of bubblewrap and then the hard work began - rubbing - and more rubbing - then a pause while we planned where each of our knotwork cut-outs from last week was going to be positioned. 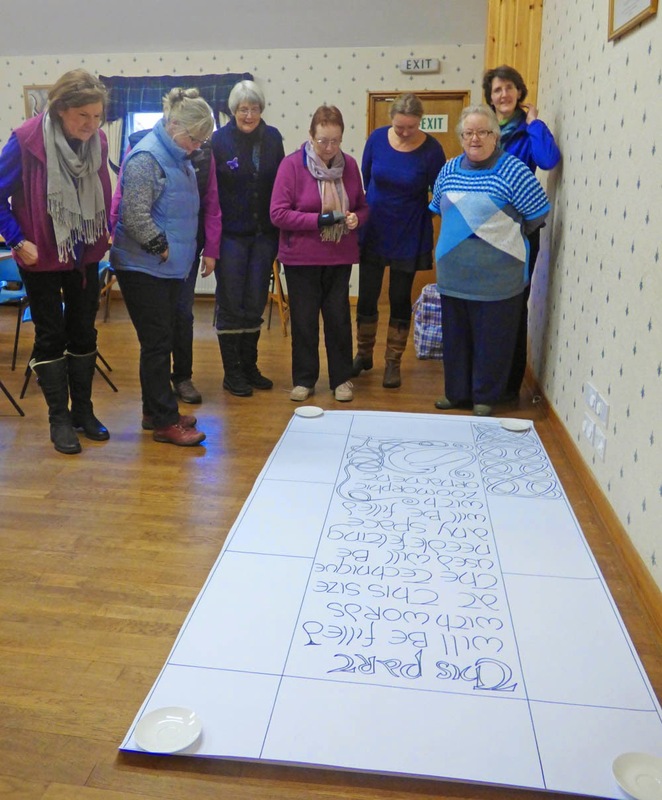 We did a bit of shuffling around on the paper plan until we were happy with the balance of the design and then all the pieces got transferred onto the large piece of white half-felt on the table. A couple of the pieces were quite fragile so the transfer had to be done very carefully. Once in position, the next step was to carefully cut through the top layer of each of these knotwork panels so that we would get the impression of the "over-under" sequence. Some got the hang of it quicker than others and you may find the odd mistake in the finished piece! 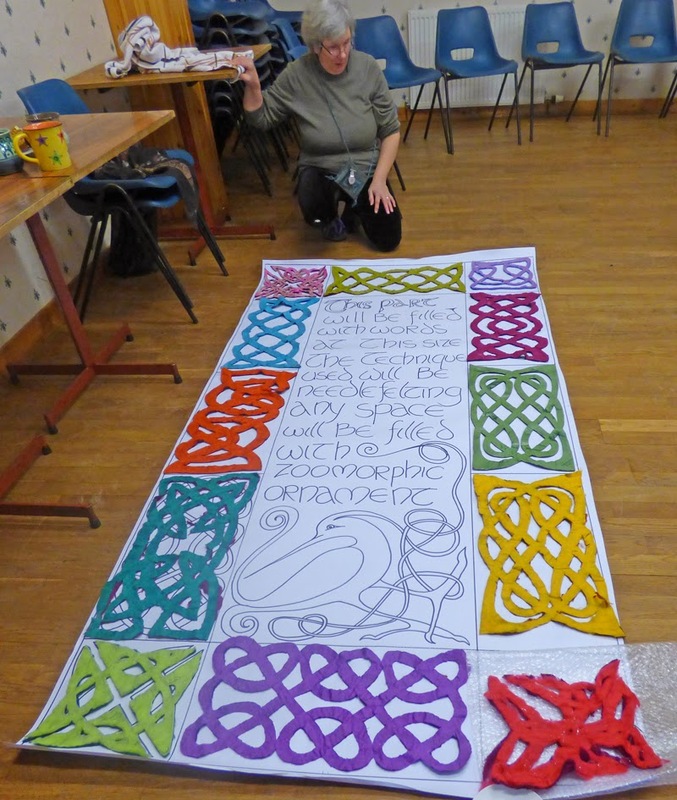 The way this works is that the top colour is subject to more friction when we start to felt so the fibres shrink more, leaving the darker colour below exposed and giving the appearance of a fine border around each piece of knotwork. We replaced the bubblewrap and the serious rubbing began. 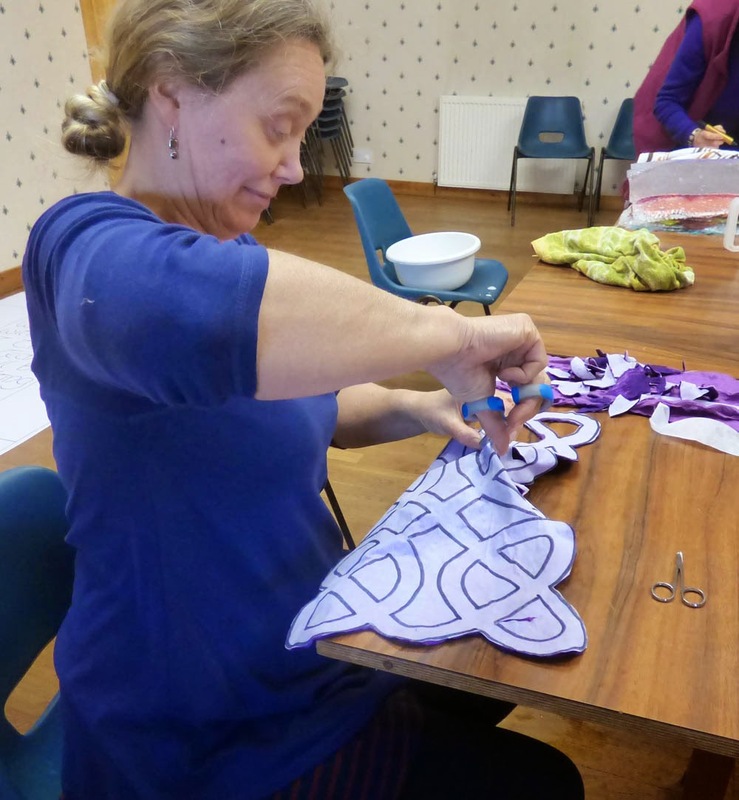 We started by working over the knotwork panels and gradually increased our speed and pressure to felt everything together. The rest of the afternoon was spent rubbing......and rubbing........and rubbing! Once it was all beginning to fully felt, we sneaked a look at the back and could see the coloured fibres coming through the white - a good sign that it's all working as it should. At this stage we turned it over - not the easiest task, but team-work triumphed. 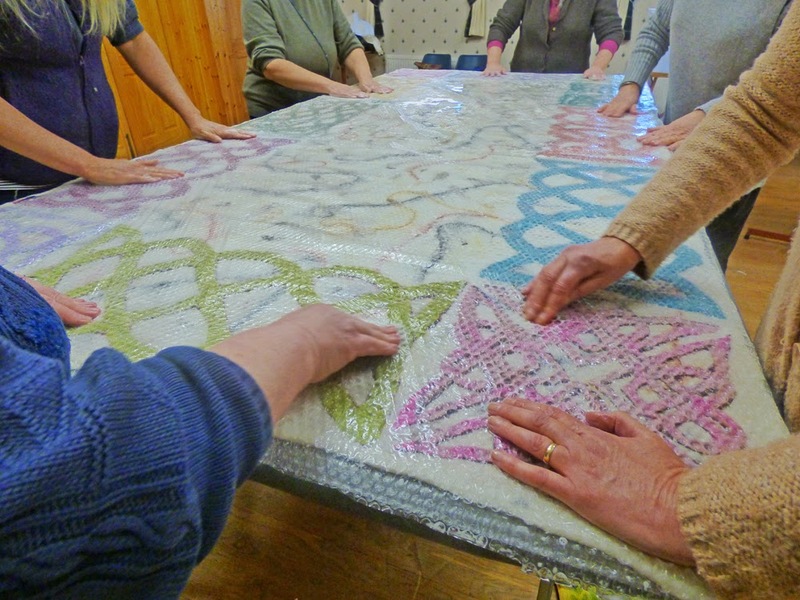 At first people were a bit dissappointed to lose sight of the colours, but as we worked at the rubbing, the patterns started showing on the back and everyone got quite excited about how well it was working. wallhanging. 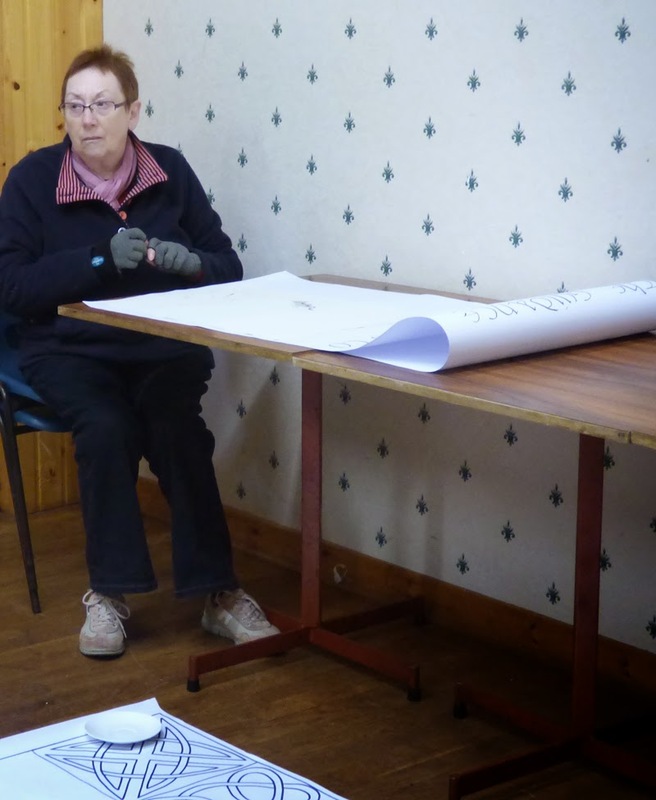 She looks a bit glum here - but she really was enjoying herself and every so often she supervised and offered encouragement. 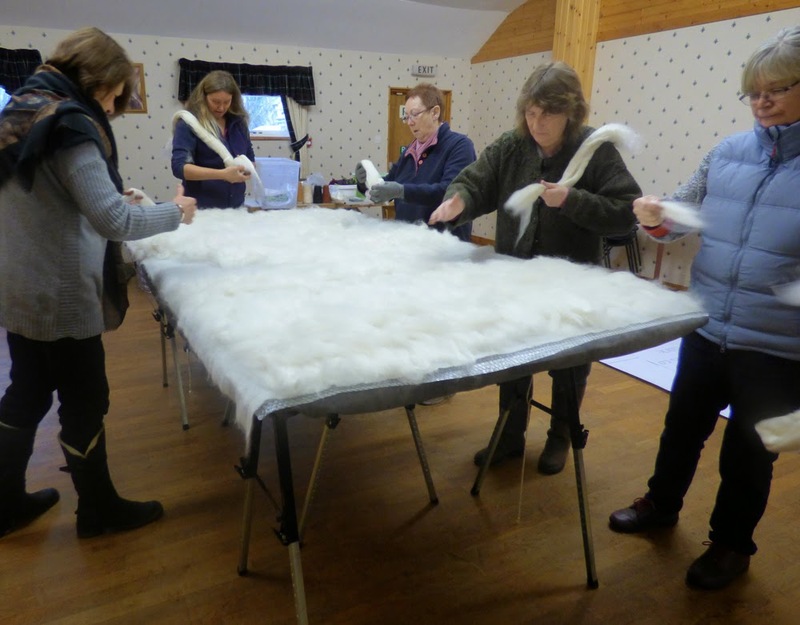 At the end of the afternoon we turned the felt back over so we could admire our handiwork, then we rolled it up, squeezed out as much water as we could and popped the felt into a big plastic box ready for the next session. To see the next stage of this project, click here.